The entire black-and-white art from the four page story, " The Hasty Smear of My Smile," written by ALAN MOORE, and drawn by PETER BAGGE (with inks by yours truly). 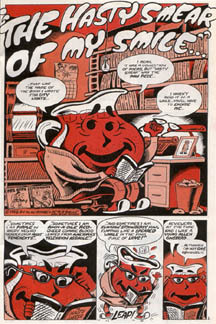 This story appeared in HATE #30, and is truly one of the most unique stories one could own from the entire ouevre of either Bagge or Moore. The original art is four pages, each india ink on 14" 17" illustration board. A one of a kind collaboration.